Here’s a rollicking Aussie version of the cumulative story, The Enormous Turnip, in a fun children’s picture book. 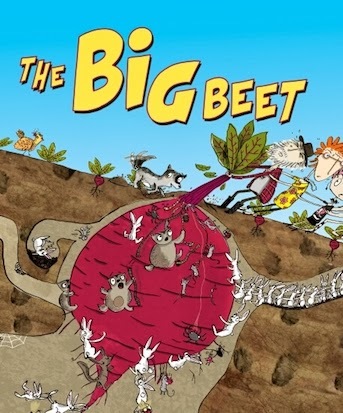 The Big Beet was written by Lynn Ward, illustrated by Adam Carruthers and published by Omnibus Books for Scholastic Australia (2013). RRP: $24.99. A fresh Aussie take on a traditional folk tale. The Big Beet makes such a fun story to act out! Children will love performing the tale as a reader’s theatre, or as improvised scenes held together by a reader/narrator. There are also teacher notes to support the book. If you’re a librarian looking for a resource to support a unit on Australia, or one on Poetry, take a look at The Big Beet.